About a month ago, I have submitted my doctoral thesis on EU networks and information flows. Tracing back the origins of this thesis could be looking into the past eight years of my life, having lived in five different countries in those years, the life in each of which has shaped the thesis in one way or another. Yet, the funny thing is that I can trace back the initial seed idea for the doctoral project to a 1-minute sequence of the film “The Matrix“, roughly starting here, when Neo wakes up after taking the red pill. I was watching the film during the siesta on a warm summer day in France in early September 2005 (quite exactly 8 years ago), and when this scene was over, I stopped the DVD and wrote down an idea: “the logistics of political processes“. I was in the middle of my university studies and I had suddenly understood what I was interested in political science. Retrospectively, it’s quite funny to realise that a scene that represents the awakening in the real world following a conscious choice to look for the truth was a Eureka moment for what would become, at least partially, an academic career (that I did not even envisage back then) in search for “truth”. Weirdly enough, the idea to be interested in the logistics of politics came from the overview shot of the huge factory in which human energy was extracted for the aliens, a (logistical) system that Neo sees after waking up. Since I had no clue about logistics, and in the absence of any even remotely related course in political science at the Freie Universität Berlin to such a topic, I sneaked into what was the closest call, a lecture on inter-firm cooperation at the faculty of economics. Through this course, I discovered the topic of inter-firm networks and eventually of social network analysis. Ever since, I was fascinated by networks, and if you have followed this blog for the past years, you have seen one or the other article linking social network analysis and EU politics as a proof. The link between networks, information flows and EU affairs only developed over time and only materialised during my first job after my studies which was totally not academic In a way, it was probably the EU blogosphere that made me finally interested in understanding how European networks foster EU information flows. 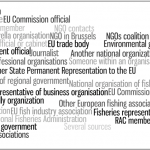 While my doctoral thesis deals with networks of events and people (“affiliation networks“) in EU fisheries policy and more traditional information flows of leaked documents based on those networks (i.e. not through social media), the link between social networks in the digital world and in the real world, similar to the links between those world in “The Matrix”, is still intriguing and fascinating to watch in EU matters. And then, late in this research process, I finally realised that at the heart of my research was actually a large large affiliation matrix of an EU-wide network – and so “The Matrix” had come a full circle. All that’s missing now is the defence of all that (net)work. This entry was posted in Publications & Events, The EU and tagged affiliation networks, doctoral thesis, eureka, social network analysis. Bookmark the permalink. Next: The EU Common Fisheries Policy reform: Getting my documents at last!